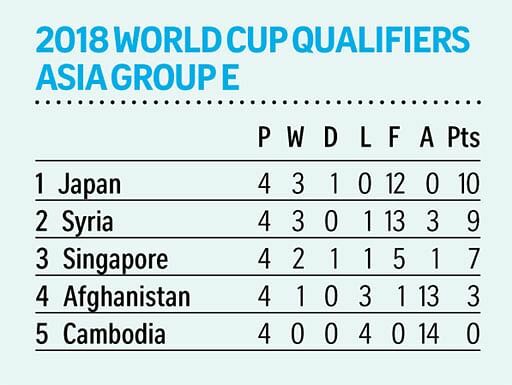 Rooted at the bottom of the five-team group with four straight losses, zero goals scored and 14 goals conceded, Cambodia's national football team are not brimming with confidence ahead of their meeting with Singapore tonight. With the Lions favoured to win this Group E World Cup qualifier at the National Stadium, Angkor Warriors coach Lee Tae Hoon was in a sombre mood at yesterday's pre-match press conference, admitting that his side would be happy with a draw. The South Korean said: "The Singapore team have shown good performance in the World Cup qualifiers. The players' abilities are (better) than ours. "We will try an offensive game tomorrow, but after a few minutes we'd change to a defensive formation. I hope for a point." He also lamented the gruelling schedule of the Cambodian league, which has seen clubs play two to three matches a week, burning out his national players in the process. Said Lee: "Our players' condition is not very good. They are tired, but we will try to do our best." Captain Kouch Sokumpheak echoed his coach's sentiments, adding that most of the players were from the Under-23 team fielded at June's Singapore SEA Games. The midfielder said: "The SEA Games team did well (despite not making the semi-finals), so the coach wants to keep them together. Yes we are tired, but we hope to try and get a draw at least. "We will look to defend first, and try to score from counter-attacks." Having watched the first half of Singapore's 1-0 win over Afghanistan, Lee said he was worried by Lions striker Khairul Amri as well as the home team's strength at set pieces. Amri broke the deadlock in the 72nd minute with a bullet header from a Faris Ramli corner. The tactician also played down the Lions' otherwise limp performance on Thursday, which saw Afghanistan miss several gilt-edged opportunities. Said Lee: "From the first half, Afghanistan played a little better than Singapore. But in the end, Singapore got the three points - and that is important."